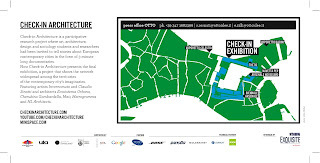 See you in Venice at Arsenale Novissimo on Friday 12th, for Check-in Architecture final exhibition. Here, what remains of the post. Magazines are not only the best way to keep yourself informed in these postmodern times - actually, the Internet is probably better - but they're also both a physical and a cultural fetish, providing a sensual experience along with a brain tickle. The feel of the leafing paper - or plastic, or tissue, or whatever material you can reach with your hand - is something mag-aficionados can hardly do without. Back in May we spoke with the zine-obsessed author of We Love Magazines, Andrew Losowsky, when he came to our very home for another round of Metaflow's Signjam. We've already shown you some here, but we've got more in store for you magazine-lovers out there. This two-part videoblog features Losowsky as he goes on and on about his mag collection, talking about every piece as a newborn child softly rocked in his arms. How moving, huh? We've already explored a less-known side of Ibiza in this mission here, but some of the guys appearing in that video deserved some more of our video-blessing. Talk about loving nature: this two absolute chiefs here represent the two sides of the alternative Ibiza. One is an old time hippie living life as it comes, happy to be given each day and to live it in harmony with the universe, the other is a tourist's best friend, providing the eccentric and informal kind of human material people expect to find on the island and the loving material women long for when leaving the city for vacation. You girls can't but quiver in excitement, you guys can't but learn how to live. We've been covering the Fuorisalone in Milan a lot when it was time back in April, but we still have something more to show you guys, even in the sweaty hot days of late-July. 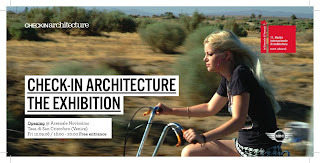 Our own Fabio Falzone interviewed the Interni magazine director Gilda Bojardi, one of the key figures who made Zona Tortona what it is today, putting it on the Design Week map. She visited our headquarters in Via Oslavia and, after we showed her how CIA works, she told us some of her precious share of Salone history. Enjoy. Perle ai Porci - italian for Pearls to Swine - is a music festival where you pay no entrance fee and, apart from the bands playing anything from ska to rock, you can enjoy a 4-day pork meat fair. Groupies should know it's no place for rockstars, but a few days of fun and a music contest make up for it. CIA has been there, documenting some of the guys playing and the atmosphere at the sport center in Casale Corte Cerro, where the festival was. And, more importantly, we were also proudly represented by our very own Andrea Lissoni, Luca Martinazzoli and Luca Legnani Jr., all in the contest jury. Check out this video for a taste of what they've seen. 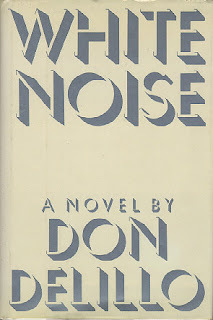 Though we're concentrating on Europe here at Check-in ARchitecture, we couldn't pass up this excerpt from Don Delillo's White Noise. We'll give a good European example of this peculiar phenomenon tomorrow. Several days later Murray asked me about a tourist attraction known as the most photographed barn in America. We drove 22 miles into the country around Farmington. There were meadows and apple orchards. White fences trailed through the rolling fields. Soon the signs started appearing. THE MOST PHOTOGRAPHED BARN IN AMERICA. We counted five signs before we reached the site. There were 40 cars and a tour bus in the makeshift lot. We walked along a cowpath to the slightly elevated spot set aside for viewing and photographing. All the people had cameras; some had tripods, telephoto lenses, filter kits. A man in a booth sold postcards and slides -- pictures of the barn taken from the elevated spot. We stood near a grove of trees and watched the photographers. Murray maintained a prolonged silence, occasionally scrawling some notes in a little book. Forget the banlieues, precarious working and laissez-faire globalization: one of the plagues of our times is the octopification of European cities. As you can clearly see in this amateur snap, France has been conquered by shiny-green octopuses who don't really care whether that couch is yours or not, they'll slide their squishy, slimy bodies upon it and whip their tentacles out of your kitchen's window. Sarkozy already asked the NATO for help, but the guys there keep scratching their heads and so far they've only come up with a chowderizing ray project, but God knows when it's going to be ready. We survived Bin Laden, but this time we're doomed. No kidding. Well, I was actually kidding. 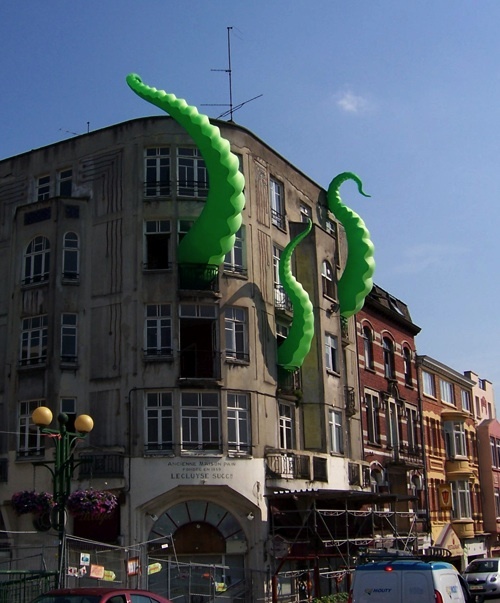 Responsible for this ludicrous piece of public art are DeviantArt's FilthyLuker and his pal Pedro Estrellas, who apparently "octo-pied" a building somewhere in France with inflatable tentacles, turning an average urban landscape in some sci-fi movie set. Looking at the tentacles' color one can't help but wonder if the picture is real or just a great photoshop hoax. Our secret hope is someone is really dealing with a giant octopus lying on his sofa, but just an inflatable one would be cool too. We're through with editing, delaying and working on the video material we collected back in Turin last week, and we're finally releasing a considerable amount of brand new stuff for you guys to enjoy. - Mario Cucinella sharing some of his thoughts on human-scale architecture and the architecture star system. It's a lot of stuff, so take your time to check it all out and come back here often for more CIA videos. Antarctica was born as a negative, starting from its very name. Antarktikos merely means "opposite to the Arctic" in Greek, and today the continent is still opposing the 21st century frenzy possessing the rest of the world by featuring the only stripe of land nobody on Earth is claiming. If we are yin, Antarctica is yang. If we're full, Antarctica is empty. For being just a mass of ever-transforming ice and condensation, the South Pole has always been rather interesting to explorers and artists, who always went there to map its landscapes, both geographical and emotional. Though maps are symbolic representations, and say what they need to say by cutting things out, thus huge gaps and ambiguities that artists can slip and play with as only artists can. Lately Antarctica's negativeness has been picked up by sound artists. Back in 1949, British composer Ralph Vaughn Williams created Sinfonia Antarctica, a metaphorical portrait of the continent, and today eclectic Dj Spooky - that subliminal kid - has come up with a crazy sound-oriented multimedia project titled Terra Nova, The Antarctica Suite. The Antarctica Suite is a 70-minute long performance, a sound map strictly featuring only Antarctica sounds, recorded by Dj Spooky himself on site. To back up the audio, the artist does also screen images from the places he visited. Although his piece has a much more technological approach to the continent's atmosphere than Vaughn Williams', the two works pair in terms of striking an important nerve: Antarctica's negativeness. Sound is negative too, it's a dense void, an integration to our experience, an invisible depth shaking beings with their own strength. A soundscape traces the perfect depiction of a still life's most distinctively platonic potential. The crackling noises of ever-rearranging ice, the quiet whistle of blowing wind, the squeak of a penguin - all along with burning-white images of snowy landscapes - are probably not enough to make you experience Antarctica, but they're maybe closer to make you feel it.